Wentworth Holidays at Grasmere01493 720382work01493 377573fax ChaletWentworth Holidays in Caister near Great Yarmouth is a quiet, family run site with 13 chalets available for rent. We tend to attract those families who prefer a bit of peace and quiet to activity and razzmatazz, and use us as a base to explore the surrounding countryside, beach and Great Yarmouth, along with the Broads and other local attractions. Our on site facilities for children are limited to a small play area on Grasmere. Sorry, we do not accept dogs or teenage parties in our accommodation. Our emphasis has always been on personal and friendly service. Within a mile of our entrance there are 4 public houses, 5 supermarkets including Tescos with cashpoints and a Lidl store, a butchers, a newsagent/post office, a chemist, several hairdressers, a wide range of restaurants/takeaways, and a bookmakers. We offer a fair deal guarantee. We are happy that we have presented a fair and accurate description of our park and accommodation provided. If within one hour of your arrival you find we do not come up to your expectations and are ready to leave then we will fully refund all monies paid (less booking fee) as you go. Wentworth Holidays in Caister near Great Yarmouth is a quiet, family run site with 13 chalets available for rent. 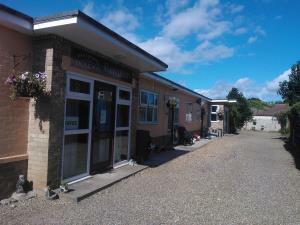 Wentwotth Holidays in Caister near Great Yarmouth, quiet, family run site with 13 chalets available for rent. Proprietors resident nearby, children welcome but no play area on site, no dogs allowed. Freeview TV. Laundry facilities onsite. Supermarket, restaurant, pubs, takeaways, gym, swimming pool, beach, golf course all within half a mile. Greyhound/stockcar racing 1 mile, racecourse 2miles, bus stop 500 yards takes you into Great Yarmouth Town Centre and seafront (3 miles). Children welcome from any age. Take the A149 from Great Yarmouth and enter Caister at the roundabout by Yarmouth Stadium. After 0.5 miles, turn left, just before bus stop. Signposted and immediately after end of terrace house colourwashed blue. Note: if entering Caister from A1064 - as you approach Caister Parish Church you need to be in the left-hand lane. The right-hand lane is for traffic entering the Old Hall and new Lidl store only. From Great Yarmouth - 2 miles. Take any bus to Caister-on-Sea: ask driver for Tan Lane stop.